By Patrick Connelly, originally published in Buffalo Law Journal, Buffalo Business First on Mon, 11 Mar 2019 06:00 EDT. When it came time in 2011 to christen the new federal courthouse in Buffalo, Jamestown attorney Gregory Peterson had the perfect suggestion. 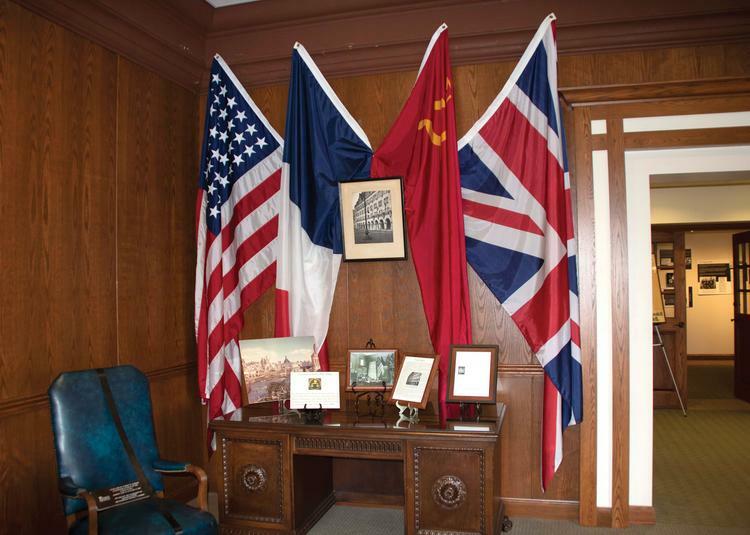 Established in 2001 in Jamestown, the center features a replica of Jackson’s office in the mid-1940s during the Nuremberg trials and a 1954 edition of the Washington Post announcing a landmark ruling. 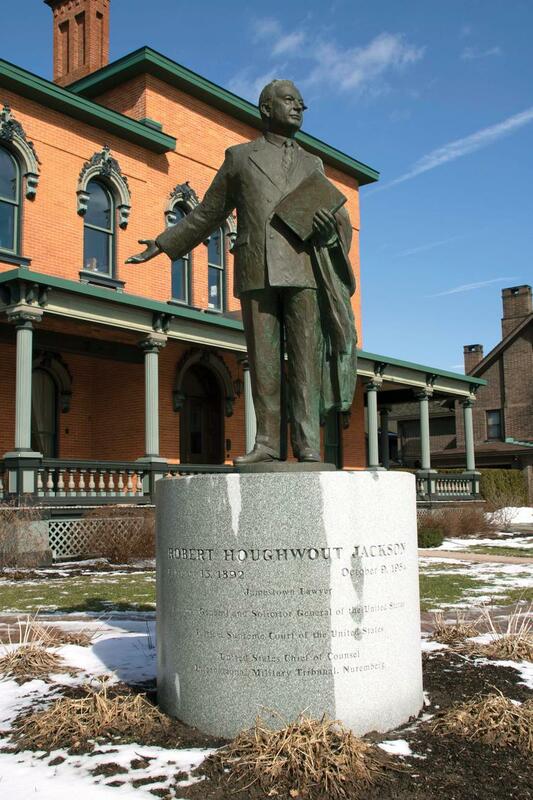 He had spent the decade leading up to the courthouse’s opening on research of Chautauqua County native Robert H. Jackson. He compiled hundreds of hours of interviews related to the life and legacy of the former associate justice of U.S. Supreme Court. Peterson, managing partner of Phillips Lytle LLP’s Jamestown office, helped establish the Robert H. Jackson Center in 2001 in Jamestown. He said he was amazed to learn more and more about the influence Jackson had and continues to have on the nation’s legal framework. “I personally had no idea as co-founder of the relevancy of Jackson today,” he said. When he suggested Jackson’s name for the new courthouse in Buffalo, officials looked no further. While Jackson’s name is emblazoned on courthouse signage, his legacy is brought to life 90 miles away at the Jamestown center. 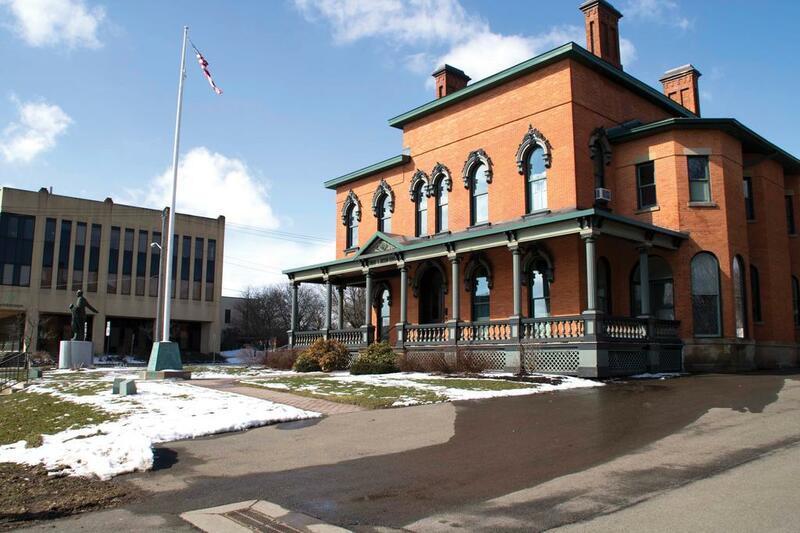 With memorabilia from Jackson’s career on display and events hosted in the theater and banquet hall, the center’s goal is to educate visitors and Chautauqua County’s youth on Jackson’s influence. Born in Pennsylvania but raised in the Chautauqua County hamlet of Frewsburg, he became a lawyer at age 21 and settled in Jamestown. Jackson later ascended to U.S. solicitor general and attorney general before being named a Supreme Court justice in 1941. He served until his death in 1954 and presided over a number of landmark cases. The center was established as a means to learn more about the man who called the county home, Peterson said. “There was a curiosity in the history. There were a lot of unanswered questions,” he said. Among the visitors have been Supreme Court Justices Ruth Bader Ginsburg, Sandra Day O’Connor, John Roberts and the late William Rehnquist. The building in which the center stands was constructed in 1858. It belonged to the Kent family of Jamestown until 1920 when it was sold to the Scottish Rite, of which Jackson was a member. Peterson and his team purchased and restored the building to its original luster. They opened the center in 2001. “What you see (now) is original, but it wasn’t this way when we bought it. It was really rough,” he said. Today, aside from serving as a museum dedicated to Jackson, the center hosts events and is a gathering place for community organizations. Elementary and high school students in Chautauqua County learn about Jackson in their regular curriculum. “There’s this wonderful opportunity (with the center) to educate because no one has misimpressions (about Jackson) because they just don’t have impressions,” Peterson said. Jackson was born in 1892 in Warren County, Pa., and graduated from Frewsburg High School in 1909. Law school was not a requirement at the time to become an attorney. He apprenticed with his uncle, Frank Mott, for several years in Jamestown and studied for a year at Albany Law School but never graduated. He passed the bar exam in 1913. Jackson briefly worked in Buffalo at Penney Killeen & Nye law firm before returning to Jamestown to serve as the city’s corporation counsel. He managed his own practice and took on leadership roles with bar associations and other organizations. Along the way, when President Franklin D. Roosevelt was a member of the state Senate, the two became friends. Later, when Roosevelt was governor, he named Jackson to a commission that reviewed the state’s judicial system. Jackson helped Roosevelt presidential campaign and, once Roosevelt was elected, Jackson served in a number of counsel and attorney general-related roles. In 1941, he replaced the retiring Charles Evans Hughes as a Supreme Court justice. In 1945 he took a leave of absence from Supreme Court to serve as chief prosecutor at the Nuremberg Trials of Nazi war criminals that followed World War II. In the Youngstown Sheet & Tube case, Peterson said Jackson created a formula that attorneys and courts still utilize today. Jackson wrote the dissenting opinion in the Korematsu case, defending Fred Korematsu’s rights as an American citizen. The opinion is read by legal scholars as the definition of the rights of an individual versus the power of the government. The center showcases a variety of artifacts from Jackson’s life and career, as well as tributes from Supreme Court justices. Visitors can see a timeline of his life and a replica of his office in Nuremberg. There are other exhibits, too, including a current one that remembers Jamestown native Charles Goodell, former member of the U.S. Senate and House of Representatives who died in 1987. He was the father of National Football League Commissioner Roger Goodell. Peterson also has a catalog of interviews he conducted about Jackson’s life and legacy, some of which can be found on YouTube. May will be a busy month at the Jackson Center. The Korematsu case will be remembered with events May 13-14 at the center to commemorate its 75th anniversary. A lecture is scheduled the next day by John Barrett, professor at St. John’s University School of Law. A play based on the case will be presented in the center’s theater, followed by a discussion with Peterson and Korematsu’s daughter Karen. On May 21, the center will hold its spring continuing education course, “The Fall of the Buffalo Mob.” A panel featuring U.S. Attorney James Kennedy and others will discuss the influence of organized crime on the region. In July, Donald Verrilli, former solicitor general under President Barack Obama, will be keynote speaker at the annual Robert H. Jackson Lecture at Chautauqua Institution. Next month, on April 18, the center will offer the “Living Voices” program for high schoolers. “It allows them to have an understanding of Jackson at an appropriate level,” said T. Marion Beckerink, the center’s director of development. “We go into their curriculum and pull out what they’re studying as it relates to Jackson. In April we’ll invite students to explore Jackson and Korematsu. … This is the first year we’re doing it with high school students. “The goal is for every student to understand organically why Jackson was so important because you can’t really tell his story inspirationally until you can appreciate the scope of what he did. We want kids to have a working knowledge of who this man was and that he walked the streets that they walked,” Beckerink said. Center officials also are busy preparing for the 20th anniversary in 2021. Peterson said the Buffalo legal community has participated in many events at the Jackson Center. The center will use part of a state grant to Jamestown to restructure the entrance on Fifth Street. In all, $1.5 million in funding will be used in upcoming renovations, said Sheryl Schutter, office manager. “It will be a large, open space that we can use for exhibits and more receptions,” she said. Portions of the upstairs will be converted to offices and, for the first time in the building’s history, air conditioning will be installed. For more information on the center and upcoming events, visit roberthjackson.org.